It’s been over a year since I bought our piano (a $100 score at a local Goodwill – you can read about that adventure here). I had every intention of painting the thing, but as life happens, it never got checked off the to-do list. Once we moved into the new house, I was determined to get it painted, once and for all. But indecision about the color put things on hold (again). I couldn’t decide between bright yellow or turquoise blue. Or green? A simple search of painted pianos yielded so many fun options for transforming a piano with paint. Here are a few that inspired me: sources: green piano, light blue piano, dark yellow piano, my piano, turquoise piano with plates, yellow piano with antlers, aqua piano, aqua piano with birdcage, red piano, lime green piano I finally decided on yellow. We chose Goldenrod from Dunn Edwards because it was a rich yet bright tone. We decided to hire a professional painter because we knew that trying to DIY this one was out of our skill set. I shopped around for “piano refinishers” but the quotes were outrageous because it involved working on the inside of the piano as well. Finally I just asked the painters who painted our house if it was something they could do. They were up for the challenge, and charged me $300 (plus materials) for the job. The used a paint sprayer, which I think is the key to a smooth finish. They sanded it, then used a primer (they actually used auto-shop primer!) and then sprayed 3 coats of paint. The piano did not come with a bench – but I found a stray bench on Ebay that needed a home for only $60. I love the mid-century legs of the bench. I painted it to match, and then added a faux sheepskin from IKEA ($10) to add some texture. I love the way it came out! Once it was painted, I went to Anthropologie to choose some funky knobs for the piano. They have so many options and for $16 it made a big visual impact. I actually took India with me and let her pick, in the hopes that having some ownership of the design would encourage her to practice.. I love the knobs she chose. Between the price of the piano ($100), the paint and labor ($380), and the knobs ($18), our grand total for this piano was just under $500. I’m very happy with how it looks and it now feels like the focal point of our living room. Now . . . how to get these kids to practice? If you’d asked me a couple years ago about composting, I would have assumed it was a fringe thing that hippie mamas in Birkenstocks did. Storing your trash and turning it into soil just seemed so . . . granola. Way too granola for this city dweller. But then I visited my sister-in-law Jodie in Seattle, and noticed a small little container on her counter that she used to collect composting items. She showed me how it worked and really demystified it for me, and suddenly I saw it as the easy, practical, and eco-friendly process that it is. So in case you aren’t composting yet, I’m here to convert you. Composting is basically the collection of waste that can break down into soil. It’s obviously ideal for people who garden, but it’s still a great practice even if you don’t use the soil yourself, because it helps reduce your waste output by breaking down your trash. If you don’t have a use for the soil you create, there are no shortage of people who garden who would be happy to take it off your hands. You would be surprised how much you can reduce your waste output by composting. Let’s start with what you can compost. After I did a bit of research I was surprised to find how many things I could compost. Coffee grounds and filters, apple cores, banana peels, tea bags, napkins, pizza boxes, brown paper bags, plain pasta or rice, old bread or cereal, paper towel rools, produce, used non-waxed paper plates, nut shells, cereal boxes, wine corks, moldy cheese, old ice cream, wine that’s gone bad, egg cartons, old loofahs, cotton balls, dryer lint, shredded paper, pencil shavings, receipts, vaccuum cleaner contents, newspapers, houseplants and flowers, fireplace ash . . . you can even chop up your Christmas tree and compost it. Getting started is easy. We just made two purchases. We bought a door-mounted garbage can that hangs just inside the cabinet under the sink. This is where we collect most of our produce for composting. It has a lid so it keeps the odor down. We also bough a compost bin for the backyard. From there, it’s pretty simple. Stick your compostable items in the bin. A couple times a week, empty the bin into the composter. Once a week, stir it really well. (BTW, emptying the compost bin is an easy chore for young kids.) That’s it! As you can see in the picture above, in a few months your items will transform into rich soil. Like magic! Do you compost? Have any tips that I’m missing? Okay, I am bringing another design dilemma to the table, because it seems that any decisions revolving around design tend to put me into paralysis mode. This one involves finding a fabric to use for window shades in the kitchen. I’ve been searching fabric options obsessively (my apologies to anyone following me on Pinterest) and I just need to make a decision already. Here is a picture of my kitchen. As you can see, there are two windows, one above the sink and one on the door, and they both get a lot of light. So much that it’s difficult to even take pictures in the kitchen. It’s less of a bright and airy light and more of an eye-straining glare for most of the day, so I need window shades that can filter some of the glare. I would also like to bring a bit more color into the room, and thought a fun fabric could serve both purposes. As it turns out, there are not a lot of modern fabric choices at most of the big window shade stores. I’ve been googling how to do a DIY roman shade and I think I can pull it off, and it will be much more cost-effective. So at this point, I just need to choose the fabric. Here are some of the fabrics I’ve been obsessively pinning looking at: 1. Dandy Flight by Birch Fabrics, 2. Monaluna Circa Starburst Sun in organic cotton, 3. Timber & Leaf by Sarah Watts, 4. Calypso by Maude Asbury for Blend Fabrics, 5. Moda Swinging Circles in Mustard , 6. Moda in Asterisks Tangerine, 7. Andie Hanna for Robert Kaufman, Modern Bliss in Leaflette Vintage, 8. Simply Color by V & Co, 9. Heather Mulder Peterson’s Summer House in Paisley Blue, 10. Citrus Fabric by Paul + Galbraith, 11. Gray and Orange Ikat Dots, 12. Midwest Modern by Amy Butler I really like all of these fabrics, and I’m getting tripped up in deciding. Do I want to stick with gray? A pop of orange? Or something with several colors? And do I want leaves or ikat or dots or starbursts?? ACK. What say you? Or do you have any ideas I am missing? Alright, folks, I’m once again coming to you with a design dilemma . . . this time, about painting the fireplace. A few months ago I wrote about all of the different options for our fireplace, and due to the fact that we have basically run out of money, it looked like painting the thing was our only option. 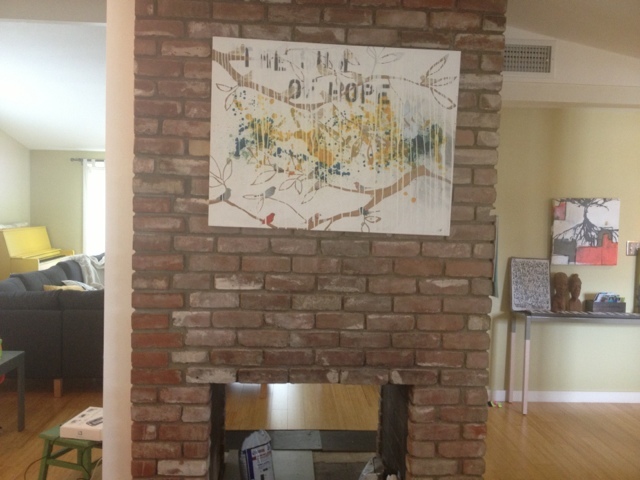 When we first bought the house, I felt like the fireplace was a huge eyesore in the middle of a dark and dingy house. Since that time, though, we have opened up walls, painted with brighter colors, and replaced windows. All of these changes have really dramatically changed the light in the house, and even though we haven’t done a thing to the exterior of the fireplace, I feel like it looks totally different in it’s new surroundings. The area of brick is much smaller since we opened up the wall, so now it’s really just a large pass-through fireplace as opposed to half of the kitchen wall. And the thing is . . . the brick is kind of growing on me. I had every intention of painting it a matte concrete gray, but now I’m wondering if we should leave it be. Of course, painting brick is a no-turning-back kind of decision. At the same time, it is a rather prominent feature in the home. This is the view as you walk thought the front door. I have also wondered about the possibility of doing some kind of a white-wash on the brick, to soften down the red tones while still keeping the look of exposed brick. I stumbled on this picture on pinterest, which I loved because it shows a white-washed brick along with the same blue we’ve got on the kitchen walls and the same white Eames chairs. So . . . what do you think? Should we leave the brick as-is or should we paint it? Is the red brick too busy or distracting, or does it work in the space? And what can be done about the unsightly black soot discoloration on the living room side?